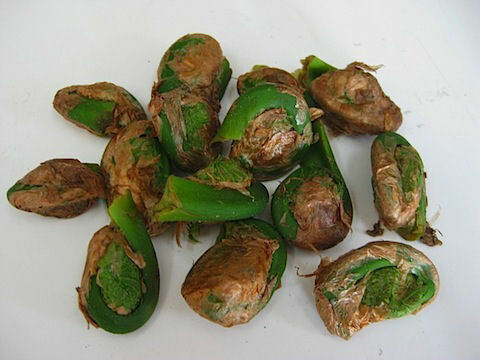 The first step in fiddlehead preparation is to remove the yellow/brown papery skin from the outside of the fern head. This best accomplished by rubbing off the skin under running water. Be sure to rinse them thoroughly in the cold running water as this helps remove any potentially harmful microbes. These fiddlehead “coins” need to be washed under running water. Rubbing gently will remove the brown papery skin….not very tasty so it needs to be gotten rid off. Fiddleheads should not be eaten raw. They must be cooked. Several years back, there was a problem with a batch of fiddleheads and so the government advises cooking them in boiling water for 15 minutes. Salt the water heavily. Cook them for 10 minutes and then change the water to remove any potential toxins and boil them for 5 minutes more in fresh salted water. Another old Maine tradition is to cook them with salt pork. To do this, initially cook them in salted water for ten minutes in boiling water. Drain them in a colander. Rinse the cooking pot thoroughly to remove any toxins and add salt pork cut into ½”cubes and chopped raw onion. Sautee the salt pork until it just begins to brown and crisp and the onions are translucent, then add the fiddleheads back in with enough water to cover and two inches more. Then simmer for at least ½ hour. Keep an eye on the pot in case you have to add more water. Serve with butter. Simple and yummy….the traditional Maine style of doing them. Fiddleheads can also be steamed. Bring a small amount of water to a boil preferably in steam apparatus. Add washed clean fiddleheads and steam for 10-12 minutes. Serve at once with melted butter or vinegar, or lemon juice, or a combination of any of the 3. The sooner they are eaten, the more delicate their flavor. They may be served, like asparagus, on toast. Cooked, chilled steamed fiddleheads can be also served as a salad with an onion and vinegar dressing. For health reasons Sautéing, stir-frying or microwaving ostrich fern fiddleheads are NOT recommended methods for cooking fiddleheads. 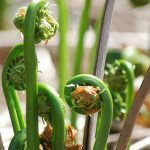 Fiddleheads should be boiled or steamed prior to sautéing or stir-frying. The CDC recommends this as a result of a problem with some people getting sick from eating improperly prepared fiddleheads back in the 1990′s. Don’t let this frighten you! Bill and I have been eating them for 30 years and have never had a problem….just prepare them properly!!!! Once thoroughly cooked, they can be served in a variety of ways. Any way that you serve asparagus or broccoli will also compliment fiddleheads. Sautee them in butter with a some chopped garlic, them serve with freshly grated Parmesan cheese. Add some bacon bits even yummier! Sautee lightly in butter, and then serve with hollandaise sauce. Add them to your favorite quiche recipe.